Thanksgiving’s over … all the turkeys have let out a collective sigh … and put away their “Eat Mor Chickin’” signs! We can focus now on the Xmas season! 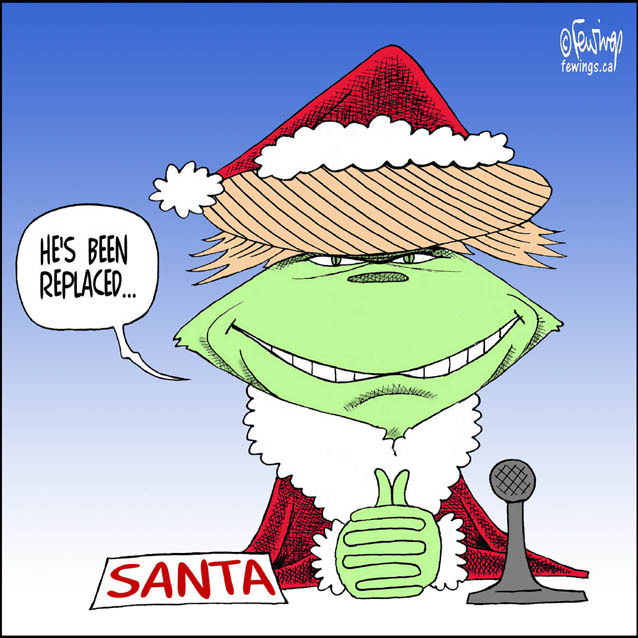 Now, the atmosphere is much more Seuss-ian … and no one spells it out more clearly than Seuss himself … are we sure he didn’t know Donald Trump? My posthumous apologies to the Good Doctor … I tried but could not come close to matching his words and style … so I only changed the name of the accused. And you thought “The War of Northern Aggression” was over! Many still say it proudly … though now mostly under their breaths. That slogan became the slogan of the South on May 9, 1865 … the day the South surrendered to the North ending our Civil War. I thought 153 years of post armistice “makin’ nice behavior” would actually assuage those feelings and smooth things out. But recently, I read about some trickery and chicanery that once again has aroused age-old and deeply buried Southern hostility. 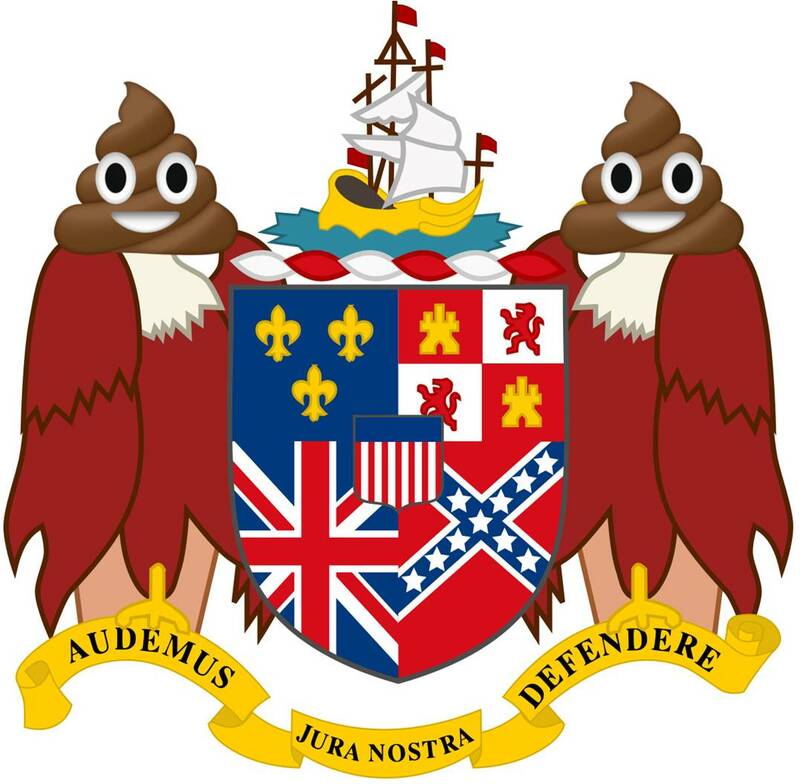 Yep, folks … an actual trainload of human defecation sent to the lovely rolling hills of northern Alabama from none other than that den of total iniquity … New York City! And Southerners are just plain tired of cleanin’ up other folks’ messes! And before the towns surrounding the Blue Sky Landfill … sounds kinda “resorty” to me … could ask, “Who’s gonna pay our Lysol bill?” … a train load of big-assed-Yankee-doo-doo sat for two months … in the sun … ripening up … while folks argued over where all this s**t was going. Well … there’s nothing like a train load of stink in your backyard to get your attention that somethin’s outta whack … and you gotta fight it. And fight it the folks of Parrish did. Here it is a few days after the crazed two year run-up to the 2018 mid-terms … and I have yet to determine whether I won … lost … or am just too exhausted to give a damn. In spite of the tsunami of media punditry attempting to explain the results of the mid-terms … I choose to focus on much more important issues facing those of us who are engaged with life in 2018. Here’s the Seriously Absurd list … so far. For those folks who still play “dress-up” one night each year, Halloween 2018 saw the demise of the “Killer Clown” as the #1 costume. Amusingly enough … the #1 costume in this election mid-term year according to Pinterest … none other than Tonya Harding. Wasn’t she the ice skater who placed the championships into her own ex-husband’s hands … and there’s the legal complication … when he bashed the knee of poor Nancy Kerrigan … the #1 skater … knocking her out of the competition? Yep … and after her December, 2017 bio-pic … “I, Tonya” … we have another American Anti-hero put up for worship. And … in 2018 if you didn’t buy your Fidget Spinner to play with Barron Trump … you’re too late. Fidget Spinners hit the toy market January 2018 … peaked in May and now occupy no space on toy store shelves. Oh wait … since Toys R Us closed it’s doors … there are no toy stores in America. What’s got everyone gesticulating to this hunk of space rock is the idea that some spacey scientists … not Kevin Spacey … seem to think this flattish cigar shaped tumbler is an alien probe that was sent on a “fly by” of earth. Mind you … there is no evidence of any kind to support this theory. 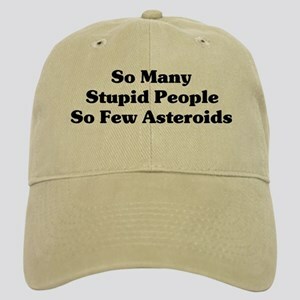 But, if you ask me … I’ll remind you we have a guy in the White House who wants to establish a United States Space Force … and he has no evidence that such a “space force” is necessary, needed or even wanted. So there you have it … a sampler of what I think about instead of who won what in the 2018 mid-terms. Lowes is selling Xmas decorations … Xmas music’s blaring on Sirius Radio … and Hallmark’s started their 2018 Xmas movie series. The “Holidays” are here … ‘tis the Party Season! We’re not talking ice cream cones here … and, who knew double-dipping could cause such a furor? Select your dipping chip … scoop dip … put the dip-laden part of your chip in your mouth … chomp … talk a bit … pause, turn and plunge your remaining gummed chip for a rerun. Immediately heads spin and whirl as if exorcized … eyes bulge … tongues wag … fingers point … shunning begins. And you know many of those finger-wagging-party-goers are the same one’s who put their unused flatware back in the drawer instead of the dishwasher. Or worse … rinse off the free chopsticks from their Chinese takeout … slipping them back into their little paper case for a rerun. 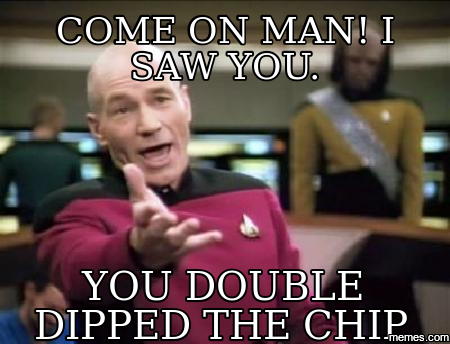 The health impact of double-dipping’’s been extensively researched. For those of us who don’t live on the cutting edge of hygiene practices, the act of double-dipping is way overrated as a cause of the plague, polio, herpes, VD, or even the common cold. “Show me the evidence,” you say? Give a “Shout Out” to Clemson University … and a real but probably obscure independent … “Germ Scientist!” Both studies pointed out important details. Crackers hold more mouth bacteria than chips. More mouth bacterium lingers from a double-dip into cheeses and creams. The fact is, from head to toe humans are germ farms. And on average, we touch our mouths, ears and eyes over 3,000 times daily! Based on this info … double-dipping’s more of an argument for bad manners than it is for mimicking Typhoid Mary!